"A Manuscript that dates back to 100 A.D. was discovered while builders were digging the foundation of a property. It tells the story of Sulumits Retsambew, it is not clear if this person really existed or another mythical figure derived from the island of Cyprus. It is written in Aramaic, the language used by Jesus Christ. Below are the words according to the translation." Sulumits Retsambew ( Soo-loo-mits Rit-sam-boo) was born on the island of Cyprus in the year 54 A.D. His mother, Fatima Retsambew, a Syrian woman who only 9 months earlier was picking fruit from the trees just miles from the Euphrates River was captured by nomadic clans and immediately taken to Damascus and sold as a slave. She would have been pregnant in the early days of her journey, before reaching Damascus. There was no way to tell who the father could have been, by the end of the first leg of the trip; every one of the men has taken her at least once. Being used like a toy or a tool by her captures in any fashion to fulfill all that they desired. After a few days in Damascus, she was sold for the first time to a friendly older merchant with many wives. The wives did not like Fatima, a young pretty girl, too pretty to have among them and they let Fatima know this. Compared to what she already went through, this part of the trip was much better. Soon after, Fatima was sick daily and she knew she was carrying a child. The merchant thinking he was sold a sickly women decided to sell her on the slave ships to Europe where he can make a good profit. She was then sent across hundreds of miles to the shores of the Mediterranean where she was sold again and placed on a boat heading west. Although a slave now, Fatima came from a proud background of brave men and hard working women. Nothing could have predicted that she or any girl from her tribe would ever experience such a tragic fate, a slave girl being used and passed from one to another like an animal and dragged hundreds of miles all the way to an unknown island in the Mediterranean Sea. Her life was a nightmare. She was tied and placed in a ship with a few others until the entire room was filled before setting sail. After weeks of daily sickness from the sea, the pregnancy and the lack food, Fatima wanted her life to end. On a cold and windy but sunny day, Fatima was allowed to walk the deck, which luckily was allowed every few days. She felt much better as the boat headed directly into the sunset. The ship was full of many women, girls and children just like her and on her way back to her holding place all the women knew that she was carrying a child and gave her the attention and smiles that made her feel good despite the circumstances . On this particular day, just as she was to be tied, the sky turned dark as fast approaching clouds quickly covered the ship and the wind turned violent as the boat was jerked in every direction until finally the ship was no more than pieces of wood floating in all directions. Fatima braced for her along with eight others to a long plank. They did not take longer than half a day before safely reaching a rocky beach, exhausted, hungry and cold. The healthy baby was born on their 100th day after landing on the island. After the baby's arrival the ship wreck became a distant memory as everyone was excited by their newest member. He was named Sulumits Retsambew after his grandfather, a traditional way of naming your first born. The grandfather was a legend during his life, Sulumits was known throughout the land stretching from Egypt and the Arabian Peninsula all the way to Persia and beyond. As a young man he was labelled a hero from his first battle, fighting for survival against the crusaders and marauders aim of destruction on who ever crossed their paths. The tribe’s nomadic lifestyle put them in harms way often during there travels of thousands of miles searching for food and a better life. Although they lived the life of Bedouins, just like birds in the summer, they found there way back to the mountains where everyone considered home, returned to the same place west of the Euphrates. Sulumits was killed in these mountains; he died in a battle by Mount Retsambew, named after him and the great battle that took him from his family and everyone that depended on his ability. Fatima was just a child at the time but not a day went by without a mention of her beloved father. With the death of Sulumitis and without his support, the other men in the tribe began to also be killed, brave men who single handily at times managed to keep the tribe from being taken over by bandits, crusaders and Romans. As the years passed the few men remaining grew older, too old to fight and eventually dwindled to where the only strategy for surviving was to hide. None were capable of fighting, begging for mercy of all and in time were ruled by who ever was passing through. It was a regular practice for many of the young and especially the attractive women to go into the hills, caves or anywhere safe until it was safe to return. The survivors of the ship wreck would not have considered themselves lucky in the days after. By the day of Sulumits's birth only 5 remained of the survivors, the oldest man died from wounds he suffered along with hunger and age, another two men went in search of food and to find people soon after the arrived and never returned. Fatima was lucky to have the assistance of 3 other women to help her in her pregnancy along with Ahemar a slave that has worked on the ship for many years and according to his stories may have spent more time on this particular ship than on land. Ahemar was free for the first time in his life on Cyprus. He became the provider, care giver, father, husband, brother and friend to the others. As the only man in the group he quickly created weapon's and other hunting tools to provide the women with fresh meat, edible plants and even the first goat was brought back on the third day full of milk From all of his findings Ahemar was most proud of his donkey, which he stumbled on after nearly being lost. He left the caves where the women, Fatima and the new born Sulumits to hunt and bring back food that was getting low, since Sulumits was born everyone was busy taking care of both child and mother that normal day to day chores were put off to the point where supplies were as low as they have been since the first few days on the island. He was gone for more than a day but returned with his new donkey. At a very young age Sulumits accompanied Ahemar on his daily hunting trips. About the time when the top of Sulumits's head reached to his companions shoulder they took off together on their longest one, which was to become the telling story of how the young Retsambew was following in his grandfathers steps. Soon after sunrise one morning, they left the others knowing that they would not return for days. There was a nearby city kingdom that they learned about from the travellers who had passed them on what they discovered to be an ancient trail that led to many little city kingdoms throughout the island. They were to go to Paphos, the nearest of such kingdoms, west of where they were on the shores of the Mediterranean. The kingdom of Paphos will have many needed things to make their life better, with its small shipping harbour where trade with ships travelling east and west brought many of these items. If the journey went well and the people they meet are friendly, then Fatima and the rest may consider moving to this city kingdom. This was a special day and they had waited patiently for it. It has taken a long time to collect enough sheep skins and wool to make this journey and make a trade worth their while. Something was different about this day, Ahemar and Sulumits felt it and talked about it. Ahmer told stories of places he had travelled and seen, the feelings he felt whenever he experienced something new. While Sulumits daydreamed about his first encounter with such places and imagined what Ahmer experienced and anticipated what was awaiting him in the Paphos. As Ahmer told his stories he was also occupied by the pain of growing old. The numerous beatings that came on regular basis as a child growing up as a slave, and even hard falls in Cyprus in the first months after arriving while learning his way around the area and learning to hunt. The pain became so severe; Ahmer finally had to tell Sulumits that the 5 day trip will take them one day longer as he will need to rest for one. Although the young Retsambew was young, very strong and a good hunter, the thought of him alone was very hard for Ahemar. He loved him more than anyone or anything he has ever loved, he was like the son and the family he never had. Sulumits went to catch some food to eat with the bread and olives. The first opportunity to capture a bird came quickly and what should have been a very easy kill of a large bird, was unsuccessful. The bird taunted him leading him further and further into the hills until the sun began to fade and hours passed without any thing to show for it. Sulumits finally realized that he would have to return empty handed. It would be difficult to navigate his way back to his camp in this strange country in the dark and it would not get any easier if he waited. Returning without anything was uncommon for him. To be gone for so long and without a meal for his oldest friend who has been taking care of him all his life was very hard to do. In the morning they were on their way before the sun began to peak from behind the distant mountains, another hot day as the temperature was already soaring. Sulumits realized that his companion was a little weak and offered to extend their stay to rest for another day. Ahmer would not consider delaying as staying where they were and letting what little food and drink they had dwindle was not smart . Hours later, as the sun was showing all its might directly above them, Sulumits noticed horsemen approaching fast from the rear. The cloud of dust left a trail behind them as if a storm was chasing closely behind. It was obvious to Sulumits and Ahmer that the three riders and five horses were headed straight to them. As the horses came to a quick stop only feet away, the dust engulfed everyone and Ahmer began to choke. The large man who sat upon a jet black horse pointed at them with his sword as he demanded “Who are you and where is it you go?” Ahmer quickly moved in front of Sulumits as he spoke, “I am Ahmer from where the sun rises. My young lad and I are heading west to the kingdom of Paphos. looking for a place to sell these sheep skins and rest our heads before returning to where we came." The man moved his horse forward toward Ahmer then turned sharply to the right and with his foot out of the saddle, he threw it viciously into Ahmer’s chest knocking him backward into Sulumits as both went to the ground. “You will load all these skins on the back of the horse or you will be lying in your own blood!” the man shouted as his men remained still and quiet. He pointed his sword at Sulumits and shouted “NOW!” Sulumits has never felt such anger, to see Ahmer rasping for his breath unable to move. He was in such a bad condition that Sulumits was afraid that his older friend would not survive. He was determined to save Ahmer. He moved slowly as he placed Ahmer’s head onto the ground and moved the hair out of his face with care. Then, like a wild possessed man and as quick as the wind, he withdrew his knife and leaped up toward the black horse and instantaneously pushing it to the nearest point he can reach, the man stomach, catching him and the others by surprise. As the knife penetrated the man, his sword fell to the ground and Sulumits picked it up and swiftly brought it back to where it had just came, ending the man’s life. A second man on his horse approached and Sulumits with a crazy look in his eyes swung and severed the mans leg before he fell to the ground. When Sulumits turned to face the third rider, all he could see was the cloud of dust as sped back toward the direction he came. As the dust cleared, Sulumits Retsambew stood surrounded between the noisy four horses and suddenly everything was very quiet. The young boy remembered Ahmer and the fear for his friend paralyzed him as he searched for him. He found much further away than he thought he would be. Ahmer was in the same place and position as he left him. He was breathing, but it was not a normal way to breath, or nothing similar than anything Sulumiots has ever experienced. Sulumits struggled to place Ahmer on the horses back. His lack of experience with horses made the job almost impossible as he fastened his unconsious friend. It was just as difficult for him to climb the black stallion as the horse would not not stand still. When he finally managed to mount him, the horse bolted and Sulumits held on with all his might just to stay on. Finally after covering a good distance Sulumits managed to bring the horse to a trot and then stop and turn around. He can see where the other three loaded horses stood still in the distance. When he returned to his friend he was feeling very comfortable. After fastening the horses together, he took the lead heading for Paphos. After a steep hill that would have taken him hours to climb without the horses Sulumits reached the top where he can see Paphos in the distance with the sea and distant mountains in the background. He was also able to see other groups of people all on foot and some with packed donkeys heading toward Paphos from other roads. He moved his horses faster toward the closest group in hope that they would be able to help his friend. Sulumits had in his posession more wealth than the wealthiest of Paphos. He discovered that the horses were loaded down with silver and gold as well as many shiny and smooth colorful material that wasn’t like anything he ever seen. He also now owned many knives, swords, bows and arrows. The sword that he took off of the dead man was very light and was such a great fit to his hand that he did not want to put it away.He did put it in it’s case though and dangled by his side as the horses aproached a group of five men leading a mule loaded and packed so high that it was barely visible. The group consisted of only one man and what appeared to be his boys a little older than Sulumits and older. When he stopped to inquire about assistance for Ahmer the four immediately bowed. Sulumits said “Please speak to me for a moment” the older man replied “Please spare us, we are your servants” “Please stand up and tell me if you can help me with my friend who was struck and injured by an evil man, he breathes though he does not open his eyes or respond to my calling.” The old man stood and as he looked at Sulumits face his tone changed dramatically “These are not your horses, they belong to Adonis, the king of theses hills – why do you have his horses?” Sulumits was more concerned about his friend than answering questions. “Listen” he said, “I killed him for injuring my friend and I will give you one of his horses if you help me.” The old man was very excited, owning a horse was beyond his wildest dreams, only the rich and powerful were able to afford horses on the island.” “I can not do anything for your friend, nor can I go with you and leave my boys however, I can let my eldest son Elias go with you and lead you to the temple where all the sick and injured are taken and there you will find the help that you seek.” “Thank you” S.ulumits said “ your son will return with a horse” and with that Elias mounted a horse and with Sulumits help and assistance they were quickly galloping towards Paphos and the temple. As he approached, the road had many more people on it and they all must have thought that Sulumits was the evil Adonis as everyone bowed down on their knees as Sulumits Restambew passed by. Elias and Sulumits rode very fast and in no time at all they were riding through the narrow streets of Paphos. Elias led him to a very large building, bigger than any structure Sulumits has ever seen. As they dismounted the horses they were surrounded by many people who recognized the horses but not the riders. A tall man came out of a large doorway and all the people bowed. Elias whispered to Sulumits “This is a priest from the temple. Ask him for his assistance.” Sulumits bowed and spoke in a high voice to be heard over the sounds made by everyone in the crowd “ I seek assistance for my injured friend and I was led here to seek your help.” “Bring him and all your horses and follow me” the man with the long black hooded robe said as he turned and began walking through the large doorway. Sulumits followed the man with Elias and the horses inside the gate. He found himself in a large courtyard with what looked like three separate buildings joined together with about a variety of dozen trees. “Tie the horses there and bring your friend inside here” the man said before he disappeared into the dark doorway. Elias helped Sulumits unload and carry Ahmer inside. The darkness was blinding as they entered, after a moment their eyes adjusted and in front of them was a long and narrow room, a statue of a naked women’s figure stood at the very end with smoke rising from either side and a table of fruits and other unrecognizable items laid in front of her. “Lay your friend on the table and I will let the high priest know that you seek his presence. Who should I say you are and where do you come from?” Sulumits gave the man a brief description of his history explaining how important Ahmer was to him and how desperate he was to help his friend. The man did not say anything and just turned and left the room. Elias said to Sulumits that there was nothing else he could do and asked if he could leave to join his family. Sulumits thanked Elias for his guidance and told him to take the horse that he was riding and to thank his father as well. As Sulumits watched the young man exit through the doorway, he turned his attention to his friend who looked very peaceful upon the table. He heard Elias ride away with the horse and from behind him a deep voice in an unfamiliar language spoke followed immediately by a loud thunder that made his ears ring. The man who greeted them earlier entered followed by three others. A large man in the middle was wearing a colorful robe with sparkles of gold and silver up and down. The other two men appeared to be his helpers in making sure that his clothing followed where ever he went. The man said “You are a powerful man. You have many riches as you have conquered Adonis, king of the hills. I shall request none of your belongings, but I would suggest that you pledge half of what you gained from Adonis.” Sulumits said that he was very happy with this and asked to please do what needs to be done to help his friend. The man said that he is to leave Ahmer and they will look after him. Sulumits asked to stay beside his friend but the man repeated that he will not help matters at all. The high priest looked at the first man that Sulumits saw and said “Georgios, take this boy, so that he can bring the Goddesses offerings for her to view the gifts” then he turned to Sulumits and said “ Go and take care of your business in the city and when you are finished come back.” The priest turned and walked toward Ahmer but Sulumits did not want to move. Georgios put his hand on Sulumits’s shoulder guiding him toward the exit. Before he stepped into the glare of the outside sun, he looked back to see the priest starting to chant as smoke began to fill the room. Sulumits Retsambew led his two remaining horses with what was left of his bounty and the sheep skins through the streets of Paphos. The young boy felt their eyes on him as he passed. Girls were coming to him and asked him to come home with them, he told them that he had work to do and he was not to rest until he was done. He saw a friendly looking boy that looked around his age standing alone, the boy was very skinny, as if he had not eaten in days. Sulumits asked if he knew where he could take his sheep skins to trade them. The boy looked surprised that he was being spoken to. He stood and as he began to speak, his face was filled with a smile that transcended him from the poor lad into a handsome young man. He told Sulumits that he would be happy to lead him to “Seo” the only honest merchant in Paphos which was a good walk away near the water. 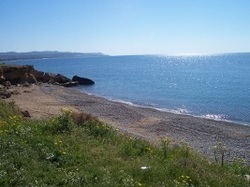 On their way to Seo, Sulumits learned many things about the boy and about Paphos. His new guides name was Michaelis who was the son of a fisherman and was killed in a fight when the boy was young enough to not remember his life prior to coming to Paphos a few years earlier. He has lived in caves around the city and during the days he would stay on the streets looking for opportunities for work and to find a meal. He had been abused by locals as well as strangers and Paphos because it had a small fishing harbor has been host to many sailing ships that docked in its harbor during their travels east, west, north and south. Michaelis told Sulumits about how the people of Paphos were divided between those who were loyal to the Romans as they have ruled in the past and those who have converted to a new religion that follows a man named Paul, that came to the island from Syria a few years earlier, he preached the words of a man who was crucified by the Romans. He also spoke in depth about the temples scattered throughout the area and their worship of the true goddess Aphrodite, Mother of fertility and love, who gave us all life to live, love and enjoy. He spoke about how women sold themselves to men and how giving their love to as many men as possible could elevate them into God- like daughters of Aphrodite. This is why women of all ages as well as young girls approached Sulumits as they walked through the streets. “You are new here, with obvious wealth and for a women to sleep with you is to capture a part of your love to hold forever.” Michaelis said, “If you pay her, it shows Aphrodite that she is worthy of your sacrifice and worthy enough to be closer to Aphrodite.” He went on to explain how the old beliefs and new ones are contradictive and has caused many troubles in the kingdom. When they finally arrived at Seo’s trading place near the water and the harbour, Sulumits was so fascinated by everything that was happening; boats coming in and out, fisherman standing on their boats working their nets, while others were cleaning fish of all kinds making it ready for the many buyers. There was a very large ship that had men working all around it and every where he looked Sulumits could see women trying to charm a man into giving them his love. Seo was an older man who moved very slowly and spoke in a very nice way that made Sulumits comfortable. He asked them to have a seat under the fig tree which was covering half of the building. Seo finished dealing with the two men he was already with. He then requested some tea to be brought to them, then turned his attention to Sulumits and Michaelis. Sulumits explained that this was his first visit to Paphos and a little about his history. “What is your name?” Seo asked. As soon as Sulumits Retsambew told Seo his name, Seo’s eyes lit up and looked as though he wanted to speak but could not form the words. Finally he said “I knew a man long ago, the bravest man I ever laid eyes on, he went by the same name.” After explaining his whole story, Sulumits and Seo realized that it was Sulumits’s grandfather that he knew. They met many years earlier when Seo was a younger man and was traveling with a trade caravan and was joined by the elder Sulumits and another man. Soon after they were attacked by bandits and without Sulumits, Seo said that they would not have survived the attack. After the incident Sulumits’s grandfather accompanied the caravan for a couple of weeks until they reached their destination in Jerusalem. During this time Seo and the elder Sulumits Retsambew became very close friends and after a few days together in Jerusalem, Retsambew headed for his home in Syria and they never crossed paths again. As Seo finished his recollection of those days, his eyes were moist with the fond memories of his friend. From the door where Seo requested tea, a girl about Sulumits’s age walked out holding a tray with three cups on it. She was dressed in a long green and white dress and a scarf tied around her head. Sulumits could not believe how beautiful she was and he could not take his eyes off of her. She did not make eye contact and after placing the tray down she quickly returned through the door. Seo said her name was Maria and she was his granddaughter and that her mother became very sick after she was born and passed away soon after. Her father was a fisherman, and took very good care of her until one day he left with his boat and other fisherman to the sea and never returned. Since then he has taken care of her and now since he has grown older and weaker, she has been taking care of him. Sulumits wondered what he could do to be able to see her again but had no idea. Seo asked Sulumits what he has that he would like to trade. Seo looked at everything that he had and after all the trading was finished Sulumits reloaded his horse with rice, spices, a small bottle of perfume for his mother and cooking ware to make her life easier. After all their business concluded Seo told Sulumits that he would like to offer him and his mother a part of his house that was not being used. He would feel much happier to know that if something happens to him that Maria would not be alone. The idea of living in the same area near her was so exciting to Sulumits that he felt that Seo and Michaelis could see what he was thinking. Seo explained that there was enough room for Ahmer and Carolina, Fatimas friend and only surviving companion from the ship wreck. Sulumits thanked Seo for the offer and his generosity. He was ready to accept the invitation, but he told Seo that he will have to go back and discus this with his Mother. He told Seo that he would return again as soon as he took care of Ahmer and returned to his mother with the supplies. Sulumits was walking through the dark streets of Paphos along with Michaelis returning to be at Ahmer’s side. He was very tired as he said goodbye to his companion with promises to look for him when he returned. He left him in the exact place that he first saw him. He wanted to get on his horse and ride out the short distance back to the temple but was very intrigued by the all the action in the streets and enjoyed the slow pace he took and all the observations he was witnessing. There was a man and woman kissing in a way that he would never have imagined before and the thought of being in the same position with Maria sent chills throughout his body. Because of the heat of the summer night the windows of every house were wide open for him to see inside and the things that he witnessed made this walk as thrilling as any time in his life. Sulumits thoughts went back to Ahmer and the anticipation of seeing his friend well again made him quicken his stride. Minutes later he was banging on the front gates of the temple and immediately they were opened by a strange looking old man who let him and his horses in, then closed the gate behind him. Sulumits quickly ran in through the doorway where he had last seen his friend leaving the horses in the courtyard. Sulumits was alone and still on the same table he had left him. As he approached, he realized that he was wearing a red shiny robe and was surrounded by flowers and lit candles that made his skin glow with the light. Ahmer’s eyes popped open and as they looked at each other Ahmer and Sulumits both smiled simultaneously. Sulumits went down to give his friend a hug, then asked how he felt. Ahmer replied with a very low tone that was barely audible that he was glad to see Sulumits but is feeling very weak. He did not say another word and closed his eyes and was back in the same state he was in before Sulumits left him. Sulumits went outside and brought a blanket from the horse and laid down on the floor next Ahmer and fell into a deep sleep within minutes. In the morning Sulumits was awakened by Georgios who was tapping him on the shoulder. Georgios asked him to follow him outside the room. “Your friend is not able to travel, and if he is to move any time soon his life can be at risk, he suffers a great amount of pain and it is best that he does not move him too much” Georgios continued talking as he led Sulumits through the courtyard toward the back where another doorway was directly in front of them. Sulumits enquired how Ahmer is doing. He only spoke to me for a moment - has he said much during the time I was away Sulumits asked as he was not sure of his friends situation and what he should do. He knew that the delays he has encountered would have his mother very concerned, especially when he thought about how much she worried about him even when he only went out for a day. Inside a great room with tables forming half circle and another table in the middle of the room was being filled with fruits, vegetables, yogurt and bread by a man as young as Sulumits. Georgios led Sulumits past the table and sat on the floor next to the larger table “ Your friend was awake a number of times yesterday, he was worried about where you went and even tried to go after you but was unable. Afterward he spoke about you and your mother and all about your life together, how he has raised you since the day you were born“. As Georgios spoke more people entered the room and took their places around the table. The room was filled and no one else spoke besides Georgios, even though the room was large it echoed and everyone could hear what was said. Suddenly, a loud thundering noise that made his ears ring was followed by the high priest entering wearing the same colorful robe with sparkles of gold and silver from the previous day. He was again followed by his two assistants. He went to the table in the middle with all the food and pointed at items that were placed on a large platter then he took a seat in the prominent middle of the table. He spoke a few words in a unfamiliar language to Sulumits while everyone looked at the ground without moving. Then everyone began to get up and move toward the food, fill their plate and return to their place. Sulumits followed Georgios to the center table where he filled up his plate and Suumits followed his lead. When Sulumits was walking back to their place on the table he realized that although his plate was filled, there wasn’t any food remaining.